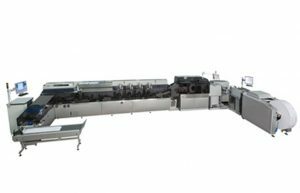 First 4 Print Finishing has bought two new CMC envelope enclosing lines to meet increasing demand for its enclosing services. The finishing specialist spent more than £250,000 on a CMC 9000 and a CMC 250, both bought from CMC Equipment (UK). The kit, which was installed in December, has replaced two older outgoing CMC machines. The CMC 9000, which has a maximum production speed of 30,000 inserted packs per hour, has been installed at the company’s Blackburn site. “This machine was chosen to bolster our door drop and media insert pack offering where we regularly see volumes in excess of 10 million packs per campaign,” said First 4 managing director David Nestor. The CMC 250 has gone into the firm’s First 4 Direct Mail site and joins a raft of other kit, including a Riso ComColor GD9630 cut-sheet printer that was installed last summer. “The CMC 250 is earmarked to have camera matching and integrity installed later this year,” said Nestor. First 4 Direct Mail was known as Vitesse Mailing Preston prior to a rebrand last year that followed First 4’s acquisition of the company in 2016. The First 4 group has also continued to grow its senior management team with the recent appointment of Edward Grant-Salmon in the newly created role of group head of direct mail. He has joined from Eclipse 4DM, where he worked for seven years, and is the son of 4DM founder Charles Grant-Salmon. “Edward brings extensive operational knowledge of the direct mail sector and we are absolutely delighted to welcome him to the team,” said Nestor.